This post is sponsored by Mezzetta but the content and opinions expressed are my own. As fall nears, I start to think about all of the comfort foods that I like to include on our weekly meal plan. 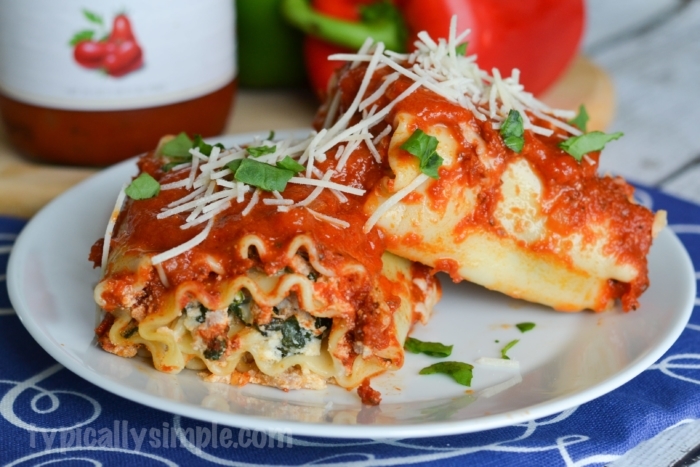 Mostaccioli, chili, and lasagna are always at the top of the list. 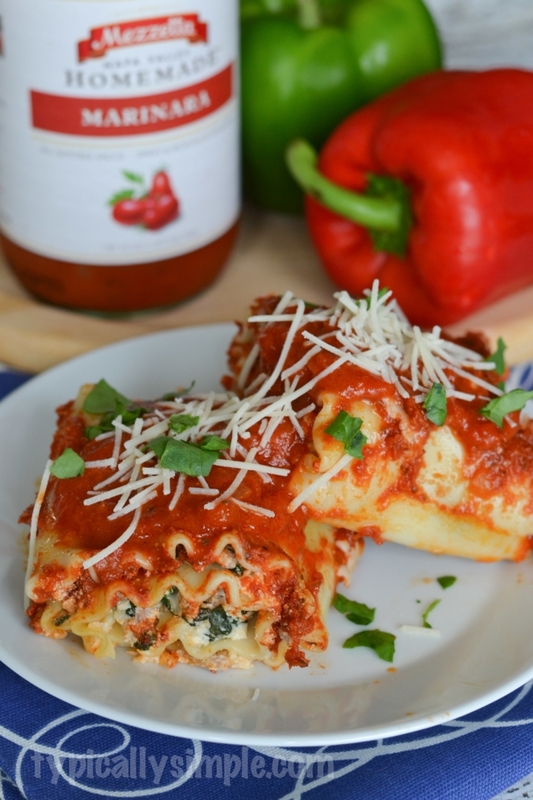 We are big on eating leftovers the next day for lunch so I love to make lasagna roll-ups for dinner. Delicious for dinner and even more delicious for lunch! There’s something about eating certain foods the next days…the flavors all soak together and make the dish even more yummy to eat. Preparing & baking the lasagna roll-ups takes about an hour, so I like to do the preparation during nap-time and then keep them in the fridge until it gets closer to dinner time when I can pop them in the oven. Because let’s face it, I’m not sure the house could handle a half-supervised toddler for an hour while I make dinner. Preheat oven to 400. Boil the lasagna noodles as directed on the box. I usually boil them for the lesser of the minute range so they don’t get too mushy and are easier to roll up. 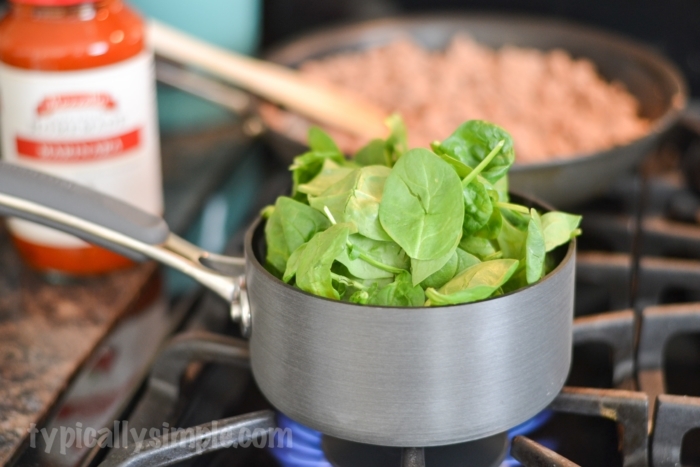 While the noodles are boiling, brown the ground turkey and blanch the spinach. All I do for this is boil some water, throw a crazy amount of spinach into the pot because it shrinks down to nothing, let it boil for about 30 seconds, then drain and squeeze out all the water. Next you’ll want to prepare the filling. 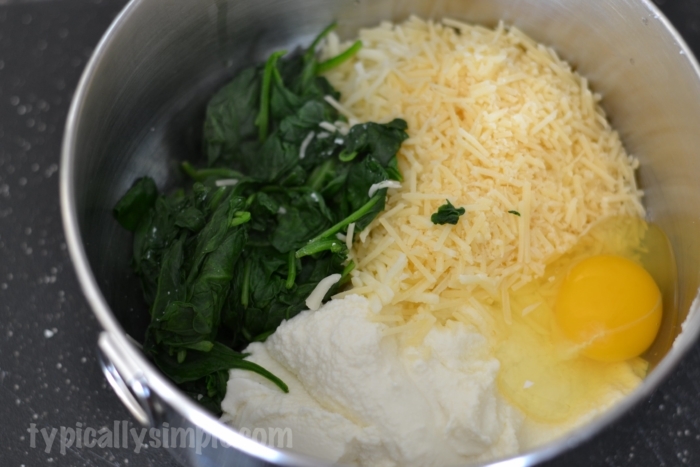 Mix the ricotta, mozzarella, parmesan, spinach, and egg. Once that’s throughly mix, add the browned ground turkey. The noodles should be ready by this point, so you’ll want to drain them and lay them out flat on a cutting board to start filling them. Spoon on the mixture and spread over the whole noodle. Roll up the noodle and place into a glass baking dish that has been coated with non-stick spray. 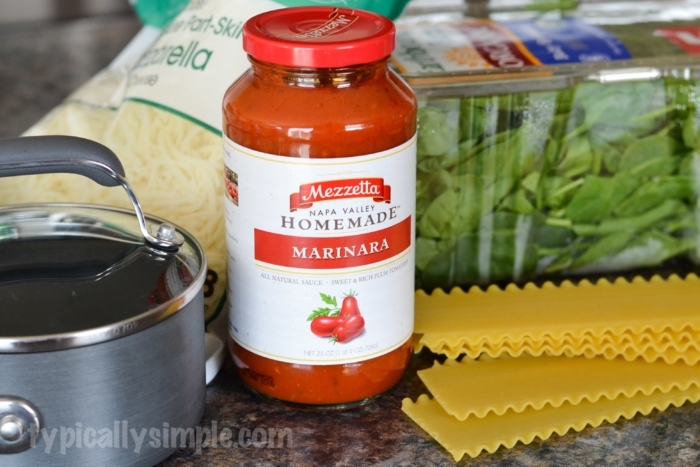 Take your the marinara sauce and cover the rolled-up noodles, making sure to cover the sides. This will help keep the noodles hydrated while baking and they won’t get dried out. You don’t want crispy noodles! 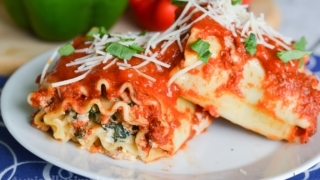 If you want extra cheesy lasagna roll-ups, you can top it all off with some more shredded mozzarella or parmesan cheese. Cover the dish with foil and bake at 400 for 30 minutes. 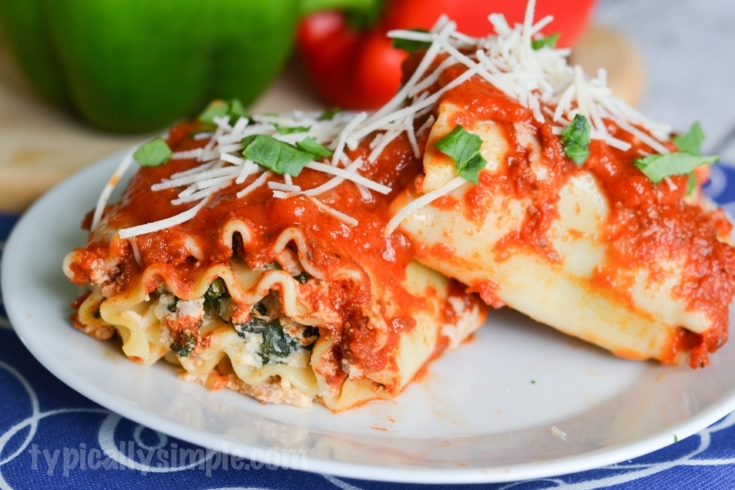 Serve with your favorite rolls or vegetables for a delicious dinner. I love that you can add ingredients to these roll-ups to make them your own! While we use a lot of ground turkey in our cooking, you can easily substitute it with ground beef. 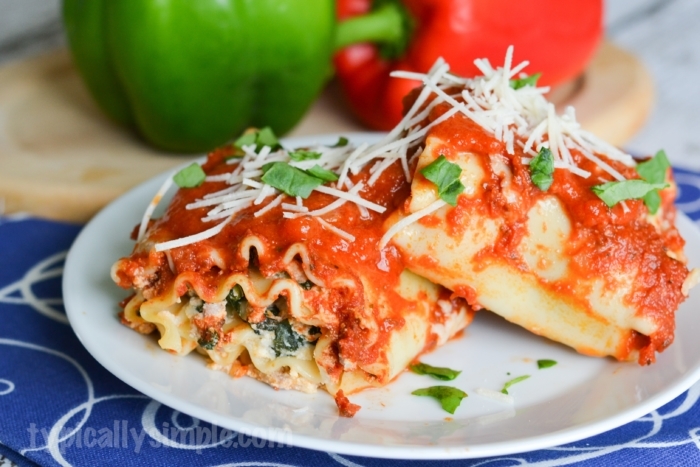 Even adding some other veggies or types of cheese would make this equally delicious. Boil the lasagna noodles as directed on the box. Brown the ground turkey and blanch the spinach. 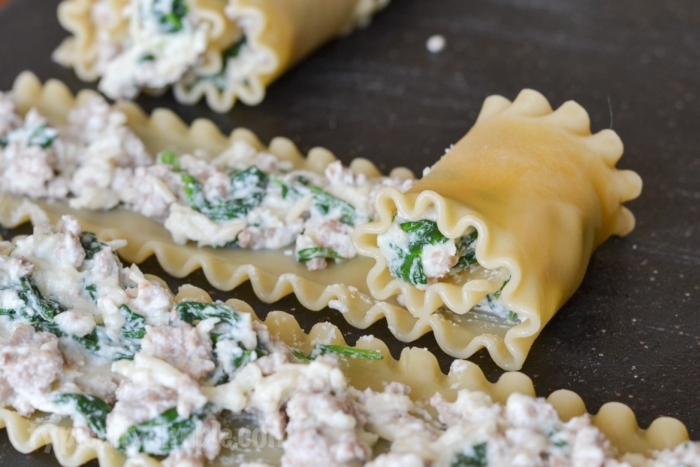 Mix the ricotta, mozzarella, parmesan, spinach, and egg. Once that’s throughly mix, add the browned ground turkey. 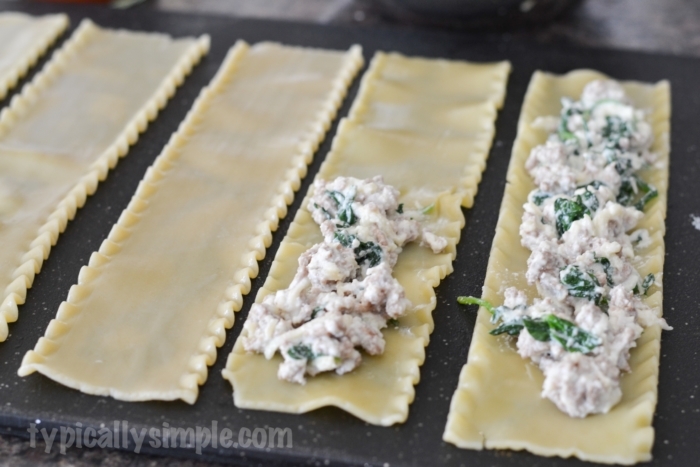 Drain noodles and lay them out flat on a cutting board to start filling them. Spoon on the mixture and spread over the whole noodle. Roll up the noodle and place into a glass baking dish that has been coated with non-stick spray. 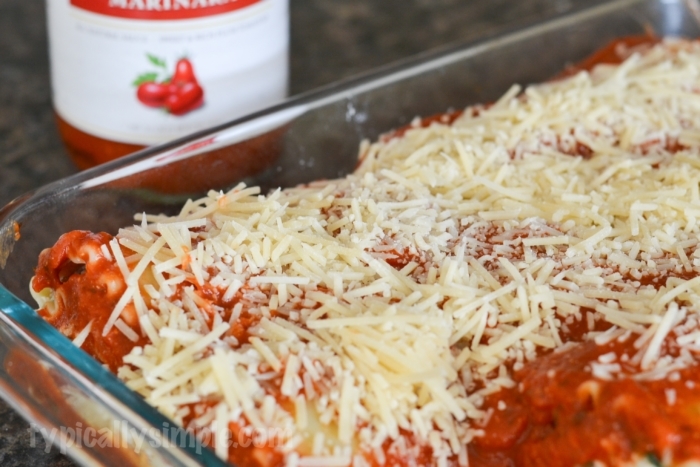 Cover the roll-ups with marinara sauce and top with more cheese if desired.